The Pakistan authorities continued cracking down on civil society, denying registration to dozens of local civil society groups and expelling international NGOs without clear explanation. They also announced a security audit of NGOs over suspicions of links to 'foreign agencies'. Critical journalists and activists continue to face arrest or warnings from Twitter that they had violated Pakistani laws. The crackdown on the peaceful ethnic Pashtun movement demanding respect for human rights has persisted, and its coverage in the media restricted. On 16th February 2019, it was reported that the government had rejected the applications of 42 NGOs, most of whom work on social-economic development, due to objections raised by government agencies including the intelligence agency. NGOs in the country operate through a Memorandum of Understanding (MoU) and Non-Objection Certificate which are granted by the Economic Affairs Division. It is mandatory for the organisation to be registered before the implementation of any project, and the MoU entitles the NGO to receive foreign funding and open bank accounts. The NGOs whose cases have been rejected by the government include Action Against Poverty, Basic Education and Employable Skill Training, Bedari, Al-Furqan Humanitarian Relief Foundation, Society for Protection of the Right of the Child, Women Economic and Social Empowerment Foundation, Medical Emergency Resilience Foundation, Poverty Alliance Welfare Trust, Aiming Change Tomorrow, BRAC Pakistan, Ameer Begum Welfare Trust, Rabt Development Organisation, Snow Leopard Foundation, Indus Resource Centre, Women Rights Association Pakistan and Rural Community Development Society. In a separate development, the Securities & Exchange Commission of Pakistan (SECP) reported in January 2019 that they had revoked the licenses of 280 NGOs registered as companies under section 42 (5) of the Companies Act 2017. The licenses were revoked as of 2nd January 2019. According to details provided by SECP, 135 of the impacted NGOs were based in Islamabad, 46 in Lahore, 73 in Karachi, 12 in Peshawar, 2 in Sukkur, 4 in Faisalabad, 7 in Multan and one in Quetta. According to the Companies Act, NGOs which had their licences revoked have to end all their activities, except recovery of any money own to it. No reasons were provided for the decision. Under the mentioned provision, the SECP may at any time by order in writing, revoke a license granted, as among the criteria specified is the company has acted “against the interest, sovereignty and integrity of Pakistan, the security of the State and friendly relations with foreign States” Section 42 5(e). In February 2019, Pakistan announced a security audit of all local and international NGOs operating across the country over the suspicion of links with foreign security agencies. The authorities said that the previous record of the organisations and their actions will also be closely monitored during the audit. Inquiries will focus on alliances between NGOs operating in the country and their links to other countries. Investigations will also be carried out regarding personnel who entered the country. In December 2018, Pakistan expelled 18 international NGOs (INGOs) from the country, after their final appeals were rejected. Another 20 groups are reportedly at risk of also being expelled after authorities singled out some 38 international aid groups for closure, without any explanation. The expulsions reflect what aid workers say is a hardening toward organisations that provide health care, education and food assistance as well as working on human rights, women's rights and free speech issues. Among the groups were charities such as Catholic Relief, Plan International and World Vision. One of the groups whose registration was denied, Plan International, said: "No reason was provided for the rejection." “No organisation has been given a clear reason for the denial of its registration renewal applications." These arbitrary actions targeting INGOs come amidst allegations by Pakistan that the United States and European countries have used aid workers as disguise for spying. Human Rights Minister Shireen Mazari said on Twitter in December 2018 that the 18 groups that were asked to leave had spread disinformation. “They must leave. They need to work within their stated intent which these 18 didn't do,” she said. She further noted that 80 INGOs had already been registered. These allegations have not been substantiated with any concrete facts. The Pakistani Information Minister, Fawad Chaudhry said he could not say what, specifically, led the interior ministry to expel the organisations. . He claimed some of the expelled INGOs failed to provide details in their applications while others did not clear security requirements. Pakistani journalist, Rizwan Razi was arrested on 9th February 2019 in Lahore over a series of social media posts allegedly critical of the judiciary, government and intelligence services,. According to reports, Razi a TV anchor for Din News, an Urdu-language news station, was detained and arrested by the Cyber Crime Wing of Federal Investigation Agency (FIA) for allegedly posting 'defamatory and obnoxious content' on social media using the Twitter account @RaziDada. Pakistani authorities have continued to restrict media coverage of the ethnic Pashtun rights movement. In December 2018, Pakistan ordered internet service providers to block the website of Voice of America's Urdu language service. VOA's "Deewa" news website, which primarily caters to the Pashto-speaking audience in the region around the Afghan border, has been blocked sporadically by various providers since late October 2018. VOA Director Amanda Bennett said she was "troubled" by the blockage of the services. "In the interest of press freedom, VOA calls upon those responsible for blocking our content to immediately remove these constraints,” she said. Journalists, Sailaab Mehsud of RFE/RL's Mashaal radio and Zafar Wazir of a local Khyber TV were charged by the police for participating in a protest rally on 12th December 2018 in Dera Ismael Khan in Khyber Pakhtunkhwa province along with nearly 20 other people. Police alleged they were chanting slogans against state institutions and inciting the public to violence. Mehsud said he and Wazir were covering the Pashtun Tahaffuz Movement rally as journalists. According to a report by the online crisis news platform Coda Story, scores of prominent Pakistani journalists and activists have received email warnings from Twitter informing them their tweets are in violation of Pakistan’s laws. Among those affected are journalists and activists who are living abroad and those who are not Pakistani citizens but of Pakistani heritage, as well as other activists who have no connection to the country. Mubashir Zaidi, a senior Pakistani broadcast journalist, received an email from Twitter’s legal department after he asked what had happened to the investigation of a police officer, Tahir Dawa, who was allegedly abducted and tortured to death. The police officer was abducted from Pakistan’s capital, Islamabad in October 2018. Dawar’s dead body was later found in Afghanistan and bore marks of torture. Naila Inayat, South Asia correspondent with the Berlin-based Associated Reporters Abroad, received a similar email from Twitter on 3rd November 2018. She had posted a meme comparing the Pakistan military’s surrender to Indian forces in 1971 — which led to the creation of Bangladesh — with the government’s dealing of Tehreek-i-Labbaik Pakistan, a far-right Islamist party accused of inciting hatred and violence against religious minorities. Reema Omer, a legal advisor working with the International Commission of Jurists, also received an email from Twitter on 21st January 2019 over her tweets discussing a possible extension to military courts in Pakistan. These military courts have come under severe criticism over their alleged violation of fundamental rights. Some of the journalists and activists who have received these warnings are among those who have fled Pakistan and live in exile after previous threats to their lives by state forces in connection to their activism. Ahmad Waqas Goraya, a blogger who was abducted in January 2017, received an email on 5th October 2018 saying that his Twitter account was in violation of Pakistan’s laws. Goraya, who now resides in the Netherlands, had said that Pakistan’s security agencies abducted and tortured him for running a satirical Facebook page. In January 2019, it was reported that the government attempted to use its restrictions on “hate speech” to pressure Google to censor a faculty petition about academic freedom. Google denied the request, which was filed between January and June 2018. According to the report, The Pakistan Telecom Authority (PTA) had requested removal of a Google Drive file containing an open letter from concerned faculty members across several universities in Pakistan. The content discusses issues related to the academic freedom and increased repression on university campuses. The letter details academic events that were cancelled, the dismissal of professors, and cancelling of courses which encourage critical thinking. The open letter was signed by nearly 200 faculty members from Pakistan, the United States, and other countries. The authorities cited Section 11 on “Hate speech”, and Section 37 on “Unlawful online content” of Pakistan’s 2016 Prevention of Electronic Crimes Act as the legal basis for removal. The crackdown on the Pashtun Tahaffuz Movement (PTM) has continued to occur. As previously documented by the CIVICUS Monitor, the organisation is calling for an end to human rights violations by the authorities against the Pashtun community in the country's tribal regions, affected by years of terrorism and armed conflict including often indiscriminate military campaigns. State violations include extrajudicial killings and enforced disappearances against those suspected of affiliations with terrorist armed groups. PTM is also calling for the removal of military checkpoints in the tribal areas which restrict the freedoms of local population. PTM activist, Arman Loni, a university professor, was arrested on 2nd February 2019 in the southwestern district of Loralai after participating in a sit-in demonstration outside Loralai Press Club in Baluchistan, in protest against against a recent terror attack. He was later found to have died in custody. According to Amnesty International he appears to have been the subject of an extrajudicial execution. 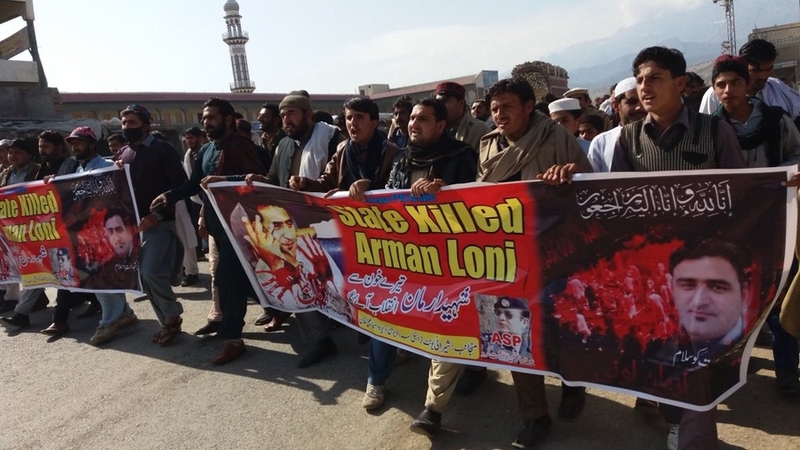 More than 80 protesters from PTM were then rounded up by police on 5th February 2019 after they had gathered outside the National Press Club (NPC) in the capital, Islamabad in a peaceful protest condemning Loni’s murder. At least 17 PTM members were subsequently charged under the West Pakistan Maintenance of Public Order (MPO) Act of 1960 and moved to Adiala prison. The law gives the government wide-ranging powers to arrest people suspected of acting in a manner "prejudicial to public safety or the maintenance of public order". Subsequently, 15 of those detained have since been released. 👉🏼#Pashtun Tahaffuz Movement leader in Balochistan, #ArmanLoni, was beaten to death by the police in a peaceful protest. 👉🏼#HumanRights defender #gulalaiismail & 17 PTM members were arrested & arbitrarily detained! One of those arrested and subjected to possible enforced disappearance was a woman human rights defender Gulalai Ismail. She was first taken to G9 Women’s Police Station before being moved to an unknown location. Amnesty International reported that following her detention, neither her family, friends or lawyer were able to establish her whereabouts. On 6th February 2019, Islamabad police released her. According to FIDH, Gulalai Ismail said that she had not been officially arrested. During her detention, she was separated from the other PTM members who had been arrested, was not charged with any offense, and was not allowed to contact her lawyer. In 14th October 2018, Pakistani authorities detained Gulalai Ismail as she re-entered the country. She was released a few hour later on bail.